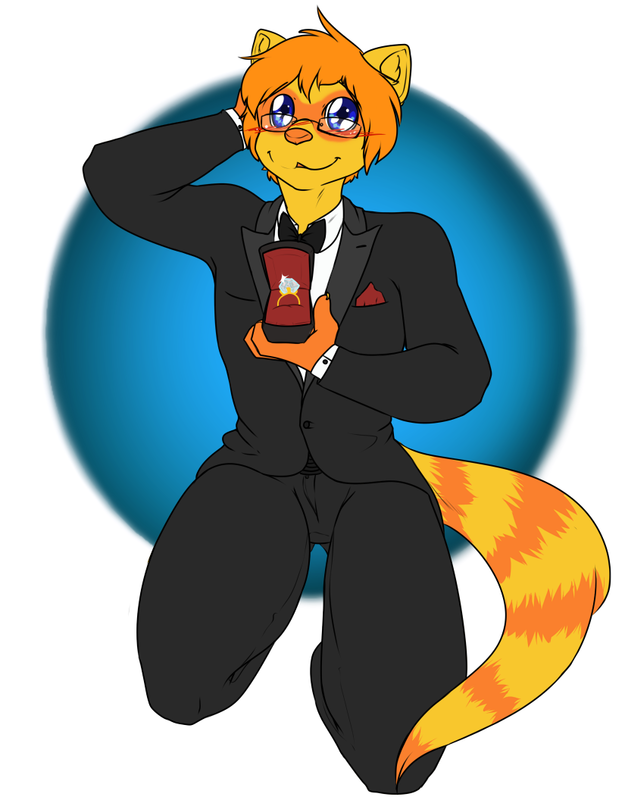 A knee-high picture drawn by messymutt, Joshy dressed in a tux and developed bright red cheeks after moments of you two talking and laughing. You wondered why he was acting so nervous toward you all of a sudden. As soon he stood in front of you with a small box in his hands, you started to recognize the signs, putting the pieces together. He gulped loudly, then said with a brief nervous giggle, "I'm not really good at this, no matter how hard I've practiced at it." He went down on one knee and slowly opened that box with trembling fingers. You spotted that a bright, glimmering diamond was professionally embedded onto a ring measured to your size. It was almost blinding how shiny it was in the light! But, you stayed quiet, maybe due to shock and a gaping maw at what was going on. "So, um", said Josh, making you gradually face up and instantly look into the ferret's blue eyes. You couldn't help but love that they grew all big and puppy like. The nervous ferret rubbed the back of his head, other hand occupied grasping that ring box, and smiled. "What do you say", he asked softly, gulping once more. "Will you... marry me?"